Introduction: Paroxysmal nocturnal hemoglobinuria (PNH) is a rare disease that can lead to thrombosis. 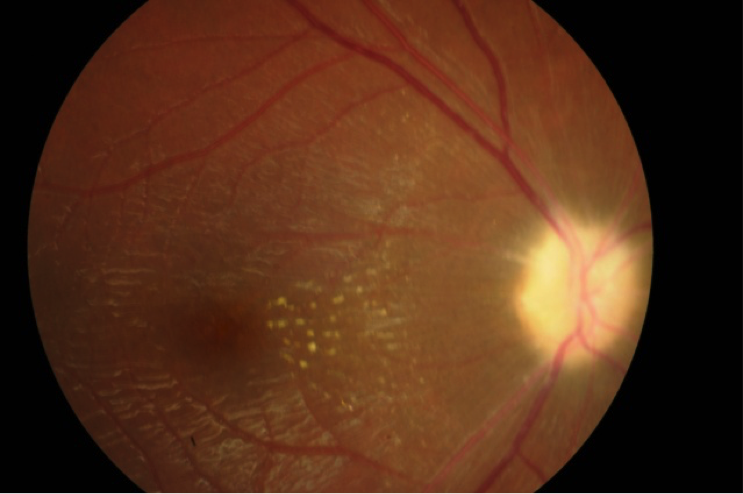 Its location is often atypical, and the mechanisms between this association are poorly understood.We report a case of acute anterior non-arteritic ischemic optic neuropathy (AAINO) during a follow-up to PNH in a child. Materials and Methods: A 12-year-old child, followed-up for macrocytic anemia associated with PNH and recently diagnosed monophthalmus right-eye (RE) ,developed acutely decrease vision of the left eye.An ophthalmologic examination showed visual acuity was limited to counting fingers in the RE, and 2/10 left eye LE. A bilateral and asymmetric Marcus Gunn sign was visible . Fundoscopy showed optic atrophy with blurred edges of the RE and papillar edema stage-III with multiple hemorrhages in the LE. A fluorscein angiographic examination indicated AAINO. Results: Anticoagulant therapy led to dramatic improvement in visual acuity (i.e., 7/10 LE) and improvement in the Goldmann visual field. The patient is now stable (8 months later) and is proposed for a bone-marrow transplant. Conclusions: The most probable associations between PNH and thrombosis are the accumulation of free hemoglobin, nitric-oxide deficiency and the formation of circulating microparticles. However, an association between PNH and AAINO has not been reported before. Paroxysmal nocturnal hemoglobinuria, or Marchiafava–Micheli disease, is considered to be a disease of hematopoietic clonal stem-cell. Since the early 1980s, advances in flow cytometry and, more recently, molecular biology, have led to a breakthrough in understanding the physiopathology of this rare disease. It is characterized by a mutation in the PIG-A gene, responsible for a lack of synthesis of the glycophosphatidyl-inositol (GPI) membrane-anchoring system. This results in a default that stabilizes many membrane proteins, including CD55 and CD59, and complement inhibitory proteins . It is manifested clinically by hemolytic aplastic anemia and intravascular thrombosis. Figure 1. Right eye, optic atrophy with a blurred edge, and papillary edema resorption. A 12-year-old child, followed for macrocystic anemia, monophthalmus of the right eye,developed acutely decreased visual acuity in the left eye. An ophthalmic examination showed that visual acuity was limited to counting fingers by the right eye, and only 2/10 vision in the left eye. The afferent reflex showed a bilateral and asymmetrical deficit. Fundoscopy showed optic atrophy with blurred edges in the right eye, and stage-III papillary edema with multiple hemorrhages in the left-eye (Figures 1,2). An angiographic examination (Figures 3) indicated anterior ischemic optic neuropathy. Because of a history of anemia, the patient was referred to a pediatrician and an hematologist: examinations revealed Marchiafava–Micheli disease. The child was treated with anticoagulants because of the major risk of thromboembolic complications. This therapy resulted in marked improvement of visual acuity to 7/10 in the left eye and in the Goldman perimetry too (Figures 4–6). The patient has remained clinically stable for 8 months. He is now proposed for a bonemarrow transplant. Figure 2. Left eye, showing stage-III papillary edema with a hemorrhage. The major problem for patients with paroxysmal nocturnal hemoglobinuria (PNH) is the occurrence of thrombosis at diagnosis or during the course of the disease There is a risk of arterial and/or venous thrombosis, and it is the most important cause of morbidity and mortality in these patients. The frequency of thromboembolic events is reported as 40% in patients with PNH and causes death in 40-67% . Figure 3. Fluorscein angiography showing early localized papillar hypofluorescence and late papillar edema. Thromboses are often multiple, severe, and localized in unusual sites. The location of a thrombosis is often atypical:i.e., intra-abdominal veins (particularly Budd–Chiari syndrome) and cerebral locations. However, thrombosis of the short posterior ciliary arteries has not been described before. The mechanisms of this associations still unknown,but are most likely caused by the accumulation of free hemoglobin, nitric-oxide deficiency, and/or the formation of circulating microparticles,which cause endothelial activation, vasoconstriction, inflammation, and thrombin generation [2, 3]. Figure 4. Improvement of LE Perimetry. The pathogenesis of hypercoagulability in PNH is multifactorial and remains poorly understood [4, 5]. One potential mechanism is that the thrombosis releases procoagulant micro-vesicles [2, 6-8].These phospholipidic vesicles are released by many cells under conditions of activation or apoptosis. They have a diameter of between 30 nm and 1 micron , and seem to play a critical role in hemostasis, inflammation, and cellular communication . Their procoagulant activity interferes with other surfaces in the expression of tissue factors, the principal initiator of coagulation , and phosphatidyl-serine externalization facilitates the assembly of components within the clotting cascade at the surface membrane . Several studies have demonstrated an increased release of procoagulant micro-vesicles in PNH [7, 8]. The efficacy and safety of primary prophylaxis and antithrombotic secondary prophylaxis are difficult to evaluate. Long-term oral anticoagulation is very risky; especially because of the risk of bleeding with thrombocytopenia, which is often seen in patients with paroxysmal nocturnal hemoglobinuria; in addition, anticoagulation is often ineffective. In addition, the occurrence of thrombosis with warfarin is not uncommon . Aspirin is not a good choice because 85% of venous thromboses reach the ocular network. Long-term treatment with low molecular-weight heparin seems to be a better choice therapeutically. However, thrombotic risk factors need to be ascertained to determine which patients could benefit from it. The only patients we can identify at the moment are those with a PNH clone and a history of thrombosis . Eculizumab is a humanized monoclonal antibody that blocks the cleavage of complement component C5. Through this mechanism, it prevents complement-mediated hemolysis in PNH. It has been shown to decrease anemia, the need for transfusions, fatigue, and to improve quality of life . It also decreases endothelial activation and the risk of thrombosis in PNH [3, 13]. Non-arteritic anterior ischemic neuropathy is the most common acute ischemic optic neuropathy. This condition typically affects middle-aged and elderly individuals, but can also, though rarely, occur in younger people. Recent evidence suggests that its prevalence is increasing. The clinical presentation of AAINO is classical and includes acute loss of afferent visual function. It is presumed to result from circulatory insufficiency within the head of the optic nerve, but the specific mechanisms and locations of this vasculopathy remain unproven. 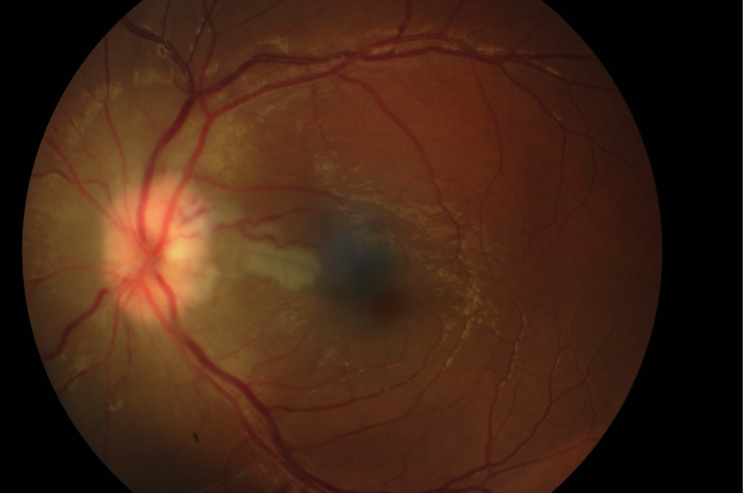 Anterior ischemic optic neuropathy, which is infarction of the optic-nerve head, caused by inadequate perfusion through the posterior ciliary arteries, is a common cause of visual loss in adults but is rarely reported in children, in part because this diagnosis is overlooked. Predisposing local anatomic and multiple systemic factors include a small optic-nerve head with a little cupping, possible intraocular hypertension, and systemic hypotension, hypovolemia, and anemia. Rare cases of AAION have been reported in the literature. It is possible that elevated plasma homocysteine is associated with AAION in patients who do not have typical risk factors, such as older age, diabetes, hypertension, or tobacco use. Hyperhomocysteinemia should also be considered in young patients with an attack of AAION.